Due diligence in cleaning and washing of cans and bottles can be addressed from Enterprise Tondelli through a number of different technical solutions to meet your requirements. In-line gravity rinser for cans. We manufacture single, double or triple lane units. These cost effective units are located immediately before the can filler at an angle and have no energy consumption except a pump. Multi stage treatments can be used such as water followed by steam or deionised air. In-line twist rail type fixed nozzle machines. 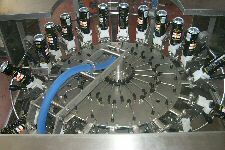 Suitable where a filling line has few container sizes and typically for glass bottles. Universal pad type driven units with fixed nozzles. Suited to applications where a great number of containers are to be used – glass jars, beverage cans, glass bottles etc. Change over is by means of a handwheels. These can also be used where “Velcorin” is used to give contact of the liquid to the head space. The treatment cycle can also be incorporated with a lowerator. Rotary neck gripper type unit. Rotary container cleaners allow the jetting nozzle to travel with the container to guarantee the cleaning cycle time and effectiveness. 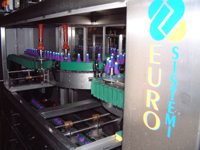 Combi units have been made for both glass bottles and also beverage cans on the same machine. This type of cleaner is often monobloced with the filler and we can supply either free-standing units or turret mounted. There is an option to offer a “baseless” cleaner where the unit has no base frame with a completely clear floor below the carousel thus ensuring greater hygiene. Double ended bottle washer up to 60,000 bottles per hour and with six soak tanks. Special attention has been focused on energy saving features and reduction of maintenance for the above units. We also manufacture plastic crate, tray and drum washers. The trays are used typically in the fresh vegetable market but can also be found in many other industries. The tray washers are remarkably cost effective and come in several different sizes.